On March 1, Minneapolis’s Heritage Preservation Commission (HPC) voted unanimously to approve demolition of the Oak Street Cinema, following the staff’s recommendation. The applicant seeking to demolish the historic building was Doran Companies, who intend to demolish it in order to build a six-story, mixed-use, student housing development called Oak Street Flats. The HPC had approved demolition previously in 2008, but the building was never demolished. Doran Companies re-applied for demolition with a proposal that would include the demolition of an adjacent building that’s currently home to The Golden Bowl, a restaurant. According to Cinema Treasures, the Oak Street Cinema opened in 1916, when it was called the Oak Theatre. It was renamed the Campus Theatre and remodeled in an Art Deco Style in 1935 by the firm Liebenberg and Kaplan, who also designed the Varsity Theater and the Edina Theatre. The Campus Theatre closed in 1989. In 1995 a group led by Bob Cowgill, now a professor at Augsburg College, re-opened the theater as the Oak Street Cinema. In 2004, Bob Cowgill stepped down from his leadership role and the theater faced severe financial troubles. 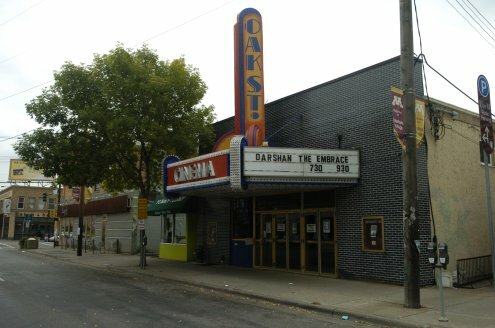 In 2006 a group called Save the Oak was formed by Cowgill and other lovers of the theater, but they were not successful at keeping the theater viable. At Tuesday’s meeting, City of Minneapolis staff member John Smoley presented the staff report. According to the staff report, the building is not unsafe; however, the applicant believes the demolition is justified to the extent of alterations to the building over time. Smoley also reported that while reasonable alternatives to demolition exist, adapting a theater building to current zoning would require extensive alterations. Smoley also said the building doesn’t fit the Heritage Preservation Regulations’ significance criteria. He pointed to six other theaters that HPC identified as historically significant in a 1989 study: the Avalon Theater (home to In the Heart of the Beast Puppet and Mask Theatre), the El Lago Theater, the Granada Theater (now known as the Suburban World), the Hollywood Theater, the Loring Theater, and the Uptown Theatre. Smoley said that the 1989 study did mention the Oak Street’s Art Deco styling installed in 1935, but very little Moderne detailing remains. He said that the building does not retain integrity—not in its original design or its 1930s renovation. “The original building materials are largely gone, especially the façade,” Smoley said. In their recommendation, city staff recommended demolition with the condition that certain mitigations be followed, including documentation that would be sent to various institutions, and salvaging of the marquee and original light fixtures, which the representative for the owner said they have found a buyer for. Initially no one objected to the proposal, and the motion was to be moved to the consent agenda. However, after it was moved to the consent agenda, one person who had said he had not planned on speaking said: “I only come up here because no one else seems to be speaking in opposition.” The man’s name is Dave Heinz, and he worked as a volunteer at the theater from 1995-2006. Heinz said he remembered growing up in Wisconsin in the 1950s, and there was a small theater called the Strand; it only cost a dime to see a movie. “By the time I got money in my pocket, the theater was empty,” Heinz said. The theater stayed empty for quite a few years before becoming the home of a religious group until it was finally demolished, meeting the same fate as thousands of movie theaters across the country. Heinz’s love for movies continued for his whole life. For many years he worked at the Jerome Hill Theatre in St. Paul, until it went bankrupt in 1993. After that, he said there was a void in his life, and he began volunteering at the Oak Street Cinema, which was almost like a family to him, he said. Heinz said that during his time as a volunteer, he often saw four films a week. There was a very tight-knit social scene among the people who loved the theatre and volunteered regularly. After the HPC board voted to approve demolition of the theater, Heinz told me, “this gentleman said a lot of technical details that I could not disagree with.” Still, Heinz said he wished that it could be saved, because it has been such an important fixture in the community. Correction: This article originally stated that for a period of time, the Oak Street Cinema was run by the University Film Society. That is not correct, and the article has been edited to remove that statement.